Here is a fun new freebie for you. 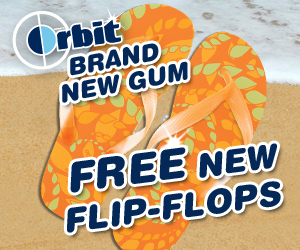 Get a FREE pair of Flip Flops when you purchase Orbit Gum. Get the details and request your Free Flip Flops here (you need to have your box of Orbit gum on hand to request them). Their servers must be getting hit hard on this one – I am getting a run time error.